Hall, Rustom & Fritz (HRF) and Jeff Green Law are law firms composed of young, energetic attorneys who shared office space in a typical office environment in East Peoria, Illinois. The leaders of these two law firms hired DKA based on our unique staff engagement process that focuses on listening to input from all employee groups prior to proposing design solutions. 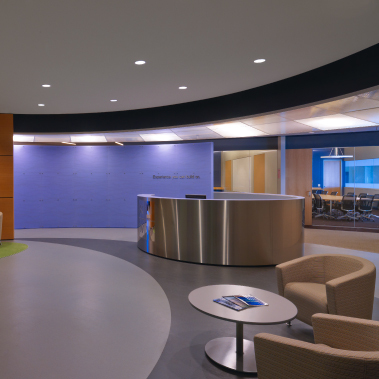 After receiving this input, the firms’ principals decided that they wanted their space to express the uniqueness of their practice, and to intentionally stray from the typical highly-decorated law firm aesthetic. 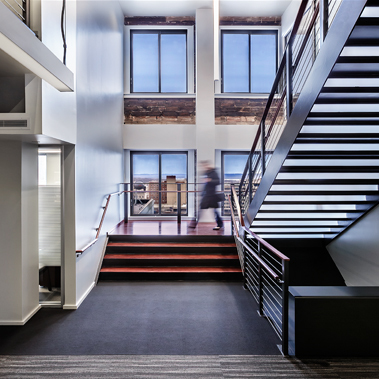 The space acquired by the firms is on the first floor of a turn-of-the-century warehouse building which features exposed brick walls and a seventeen foot tall concrete ceiling. 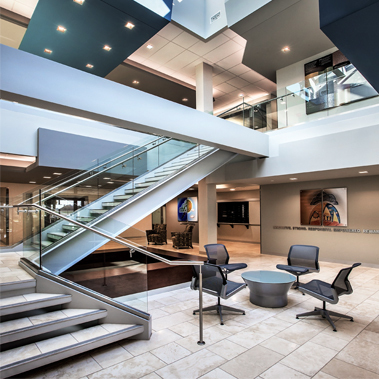 DKA provided planning and spatial geometric options that ultimately developed into a design that is not only practical for the business, but commands attention for its departure from what is expected at a traditional law office. The design solution features two cube structures upon entry. 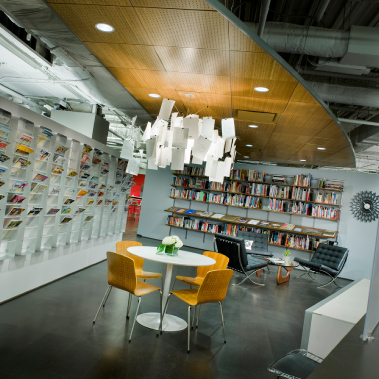 One serves as a small conference room, and the other is inverted into the ceiling above the waiting area adjacent the small conference room. Behind the cubes, glassy offices line the exterior wall.